This time we focus on only Fantasy Land. 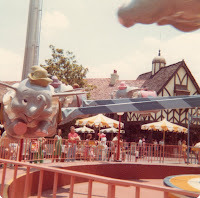 This is the home of many famous, and infamous, attractions such as the Dumbo ride and also It's a Small World. 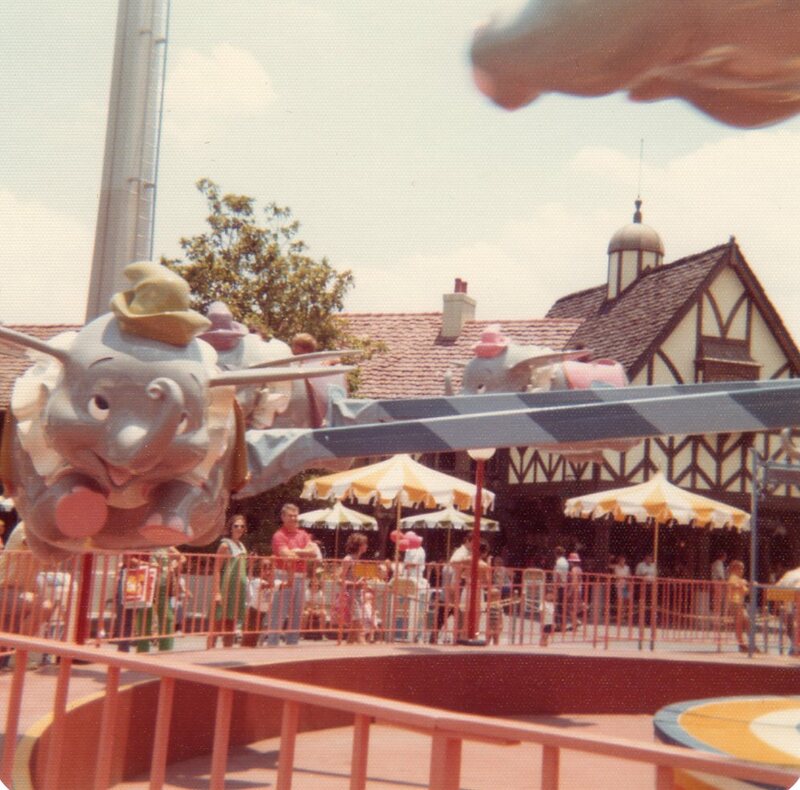 Although Dumbo has been a beloved ride since it opened with the park, It's a Small World has mixed reception. Some find the never ending tune to be part of the charm, but others find that same tune to be akin to a drill boring deep into their heads. Personally I love the ride and made it a point to ride it again during this last trip while the Mrs. sat outside and watched the fireworks overhead. In the previous post about the Liberty Square I mentioned that you could see the peak of the Fantasy Faire over the roofs in the Square. In this photo to the right you ca see that same attraction which is no more. At least not in the form it once had previously. This is now the store attached to Mickey's Philharmagic. The nice man sitting with me is my grandfather and this is one of my favorite photos of him. He is still with us, and Look forward to many years to come with him. Who knows, perhaps I can get hiim on that ride again? As you can see the ride looks much as it does now, and if you have been there recently you will remember that the ride is still as popular as ever. 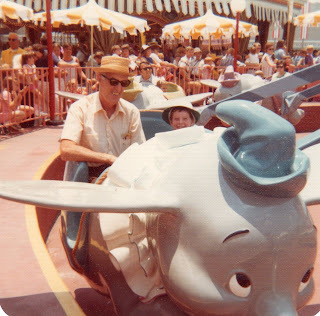 Fortunately the new Fantasyland expansion will double the amount of seats by giving us two Dumbos to ride instead of the single that exists at this time. 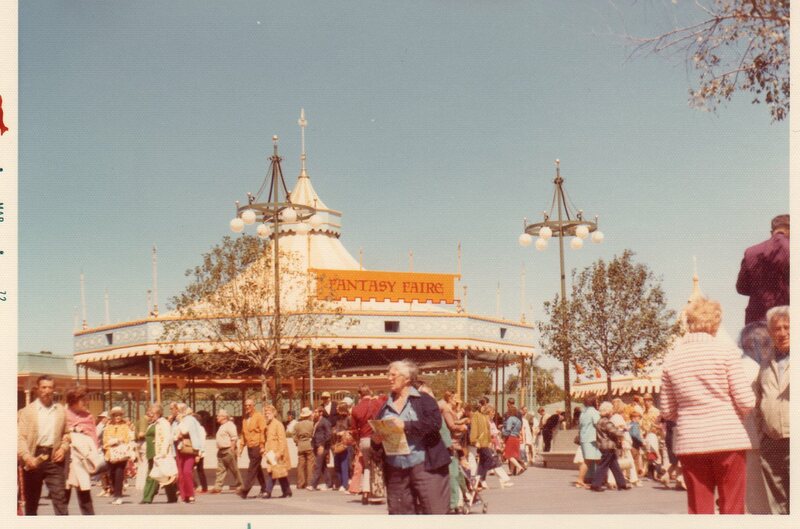 Just to keep with the process of the pictures I did have my picture taken in a Dumbo to show how time has changed. However, we chose to do it in the stationary display outside the ride since it would mean taking seats away from kids excited kids to get that picture otherwise. As I noted they are currently working on expanding the Fantasyland area, doubling the overall size and adding a large amount of new rides, shopping, and dining options. Here are a few pictures of the edge of the area and how it looks now. I hope to be able to visit in the coming year and update on the results of their efforts. Next stop, and the last in the series, will be a return to the center of the Magic Kingdom for a few shots that will truly show the changes to the park over the last 40 years. See you then!